Co-Master of Ceremonies Grady Mathews and Freddy ‘The Beard’ Bentivegna led numerous other guest speakers in honoring each inductee in turn. Of course there were old road stories galore, and plenty of good-natured ribbing, but there were a few surprisingly touching stories as well. As much as these players have butted heads over the years, it is something special to see the genuine respect these guys have for each other when it comes time for Hall of Fame honors. First up was this year’s Lifetime Pool in Action award that went to Jimmy Reid, the champion player who has been fighting a tough personal battle against esophageal cancer. 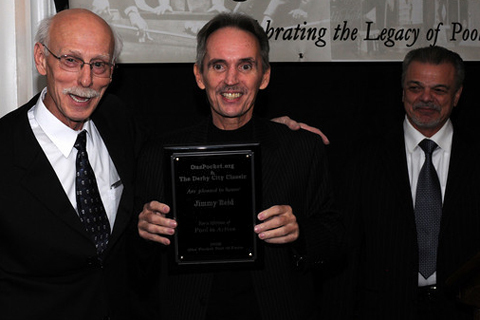 Jimmy not only came to Louisville to receive his award, he valiantly entered all three divisions of the tournament, which is tough enough for those in good health to handle. When the banquet crowd was asked to “raise your hand if you’ve got Jimmy Reid stuck,” not a single hand went up in a room loaded with great players, past and present. The man is a definite fighter, with a very strong will to survive, and we all wish him the very best. 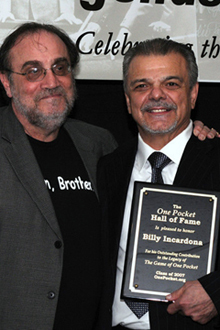 Freddie ‘The Beard’ introduced a dapper and dignified Billy Incardona, who clearly had a great time, equally ribbing his peers and basking in the recognition for an exemplary career as a great player, a savvy gambler, a wise and entertaining commentator, and a human being with a big heart. Player after player paid respects to Billy’s forty years of winning pool, and he’s not done yet, having been spotted several times in the action room at the Derby this year, with cue in hand and cash on the line. Pat Fleming spoke about the important role Billy played in turning Accustats from a statistical reporting concept for pool into the industry leader in pool videos. 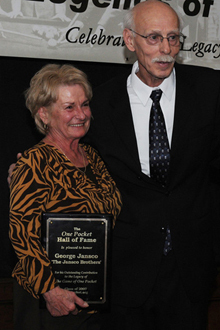 Last, but not least, was the induction of banking legend Donny Anderson in the Legends of Bank Pool category. His long-time rival and fellow Hall of Fame member, Truman Hogue, joined ‘The Beard’ in introducing ‘The Cincinnati Kid’. For years and years Donny was a banking terror in a town that had some terrors. Truman acknowledged that he never could beat Donny, and hated competing against him all those years, until finally he became a fan himself, admitting, “I guess he beat me so much I began to like him.” Despite his physical frailty, Donny was determined to stand out of his wheel chair and be helped up to the podium, where he brought the evening to a rousing conclusion with a surprisingly strong voice. 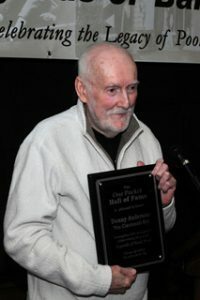 Meanwhile, Ed Kelly, who has been unable to attend the annual HOF dinner since his 2005 election into the One Pocket Hall of Fame, was able to slip over to Louisville on the Sunday after the Derby City Classic ended to receive his belated induction. 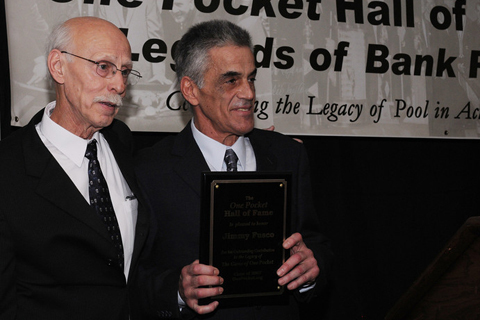 In a small private gathering of legends of pool action assembled by photographer Diana Hoppe, Grady Mathews surprised Kelly with his HOF plaque. Prev:2007 Hall of Fame votes are in!